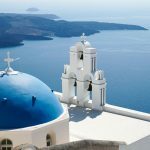 Santorini travel tips & guide — Some useful tips for Santorini first time visitors - Living + Nomads – Travel tips, Guides, News & Information! 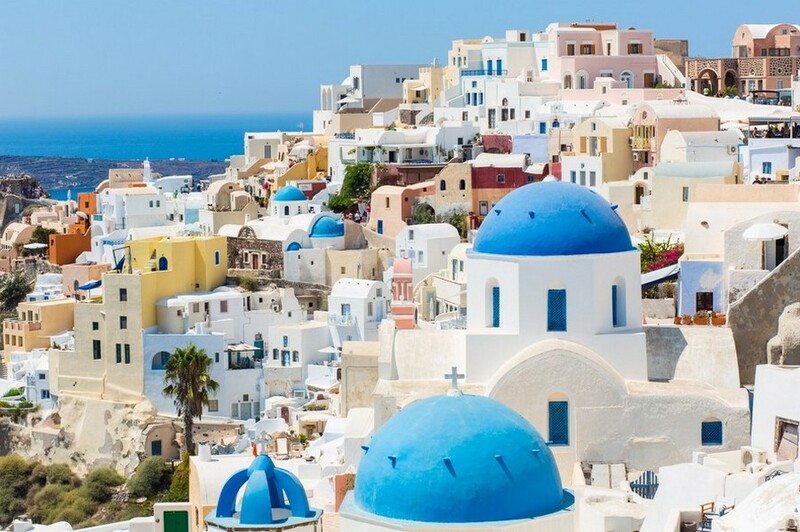 Santorini is the supermodel of the Greek islands, a head-turner whose face is instantly recognisable around the world: multicoloured cliffs soar out of a sea-drowned caldera, topped by drifts of whitewashed buildings. 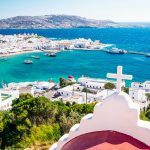 With its reputation for dazzling panoramas, romantic sunsets and volcanic-sand beaches, it’s hardly surprising the island features on so many traveller’s bucket lists. 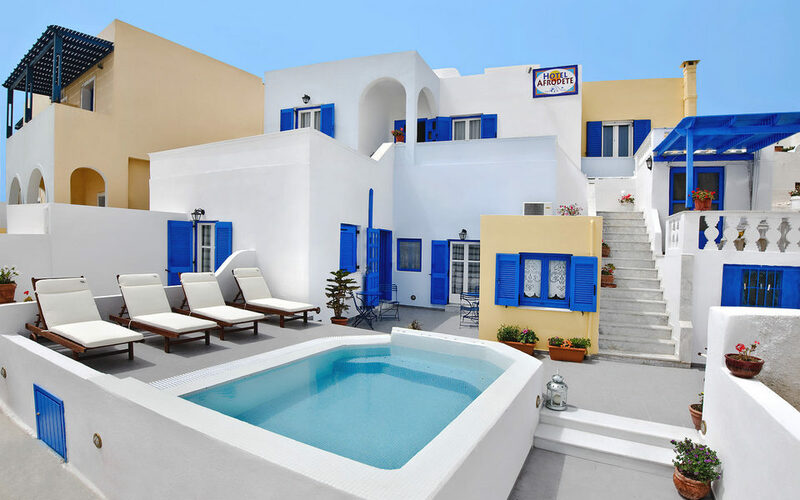 Let’s check it out our Santorini travel tips and Santorini travel guide with some useful tips and guides for Santorini first time visitors with Living Nomads below. 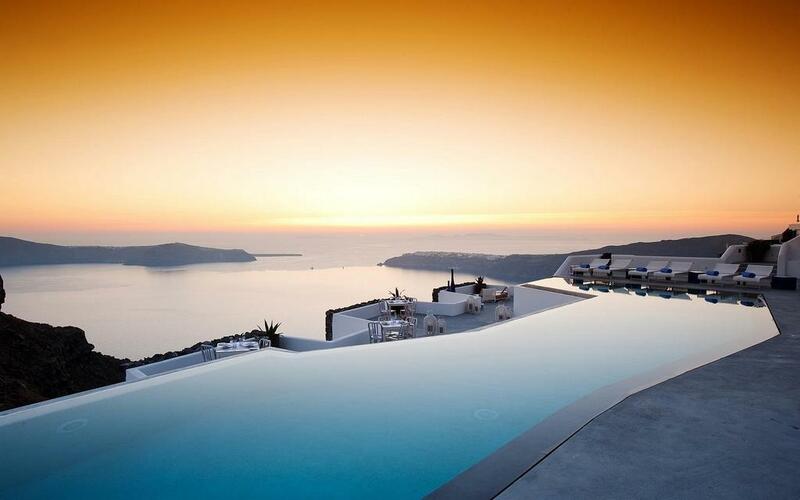 Santorini Hotel with Infinity Pool. 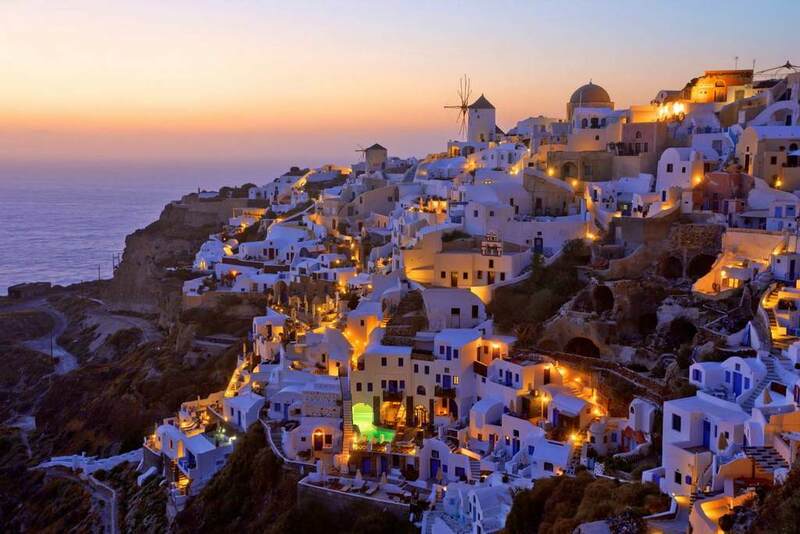 Picture: Santorini travel tips blog. 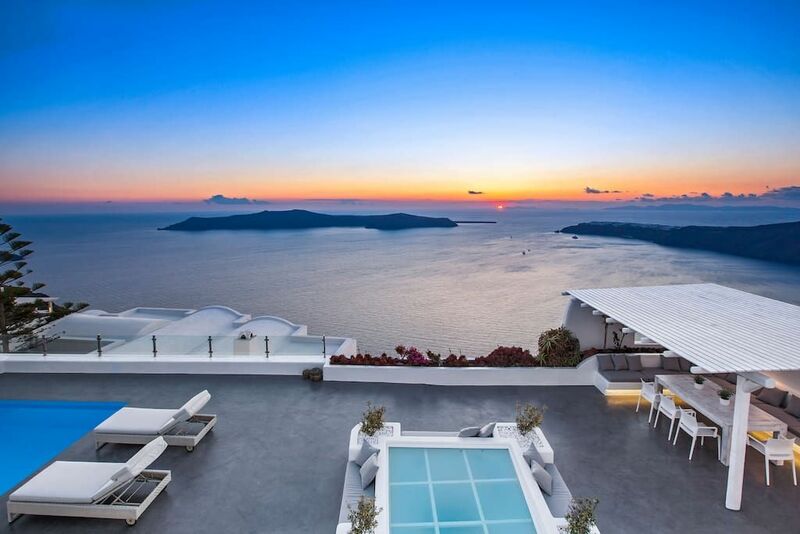 There’s no denying the uniqueness of this destination or its huge allure – Santorini hosts 1.5 million tourists annually. Here’s all you need to know if you’re planning to join that crowd. 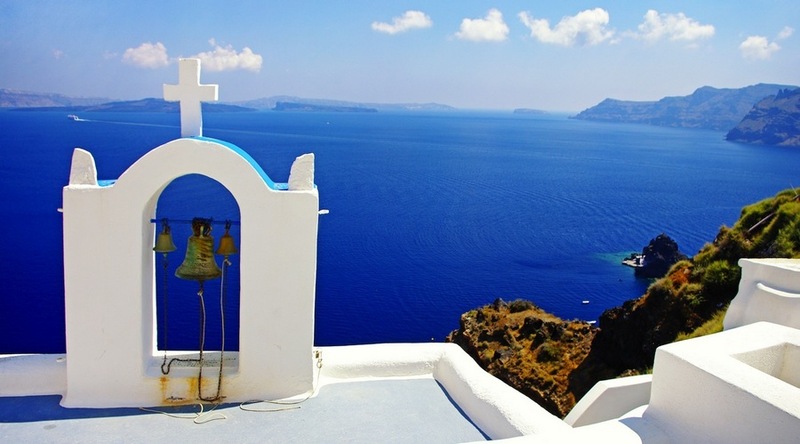 Church of Anastasis in Imerovigli village. 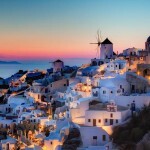 Picture: Santorini travel tips blog. 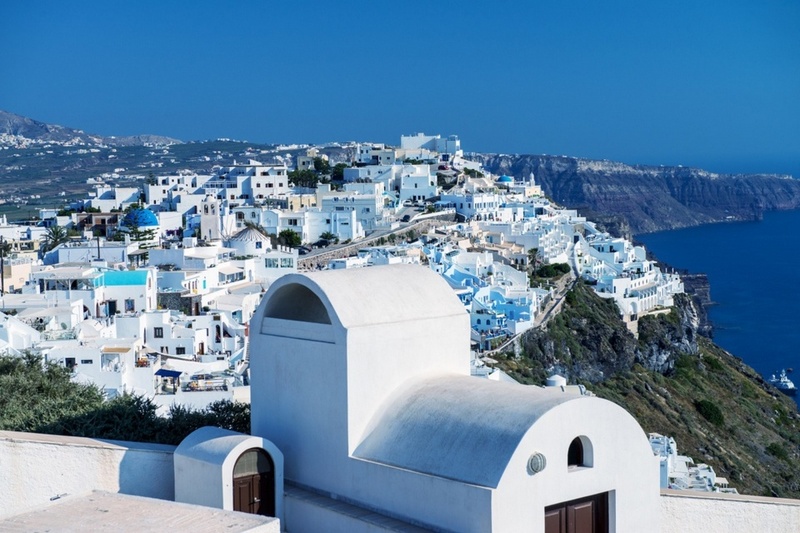 Part of the Cyclades island group, Santorini (officially known as Thira, a name that encompasses the volcanic islets within Santorini’s orbit) sits in the Aegean Sea, roughly halfway between Athens and Crete. Restaurants in Ammoudi port. 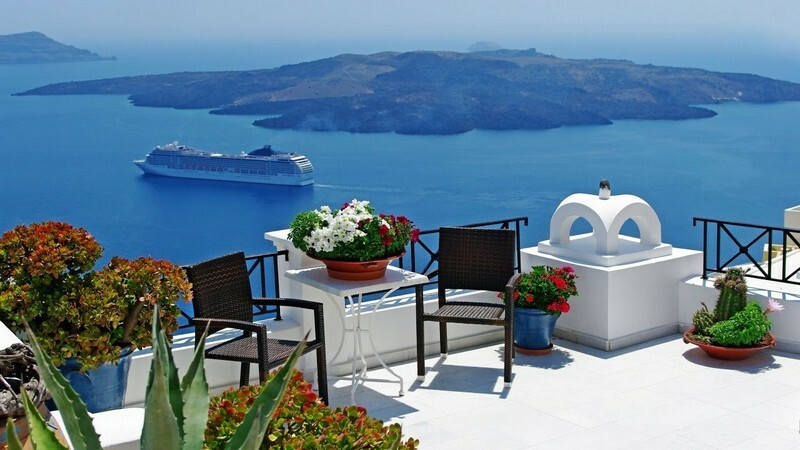 Picture: Santorini travel tips blog. 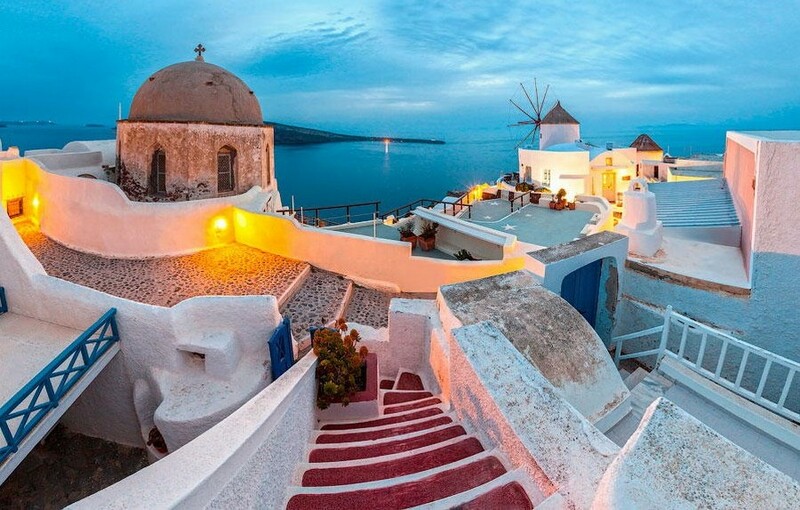 The island is shaped like a wonky croissant, and the neighbouring islets hint at the fact that Santorini was once circular; it was known as Strongili (the Round One). 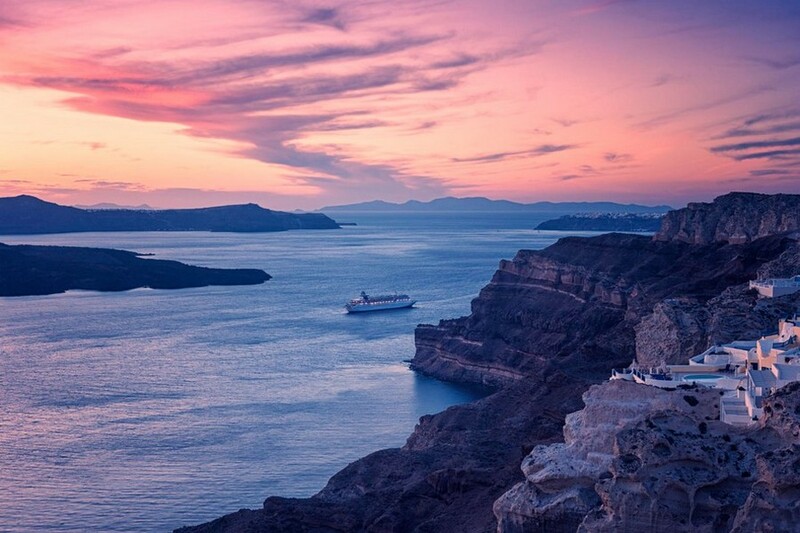 Thousands of years ago a colossal volcanic eruption caused the centre of Strongili to sink, leaving a caldera (or crater) with towering cliffs along the east side – now Santorini’s trademark landscape. 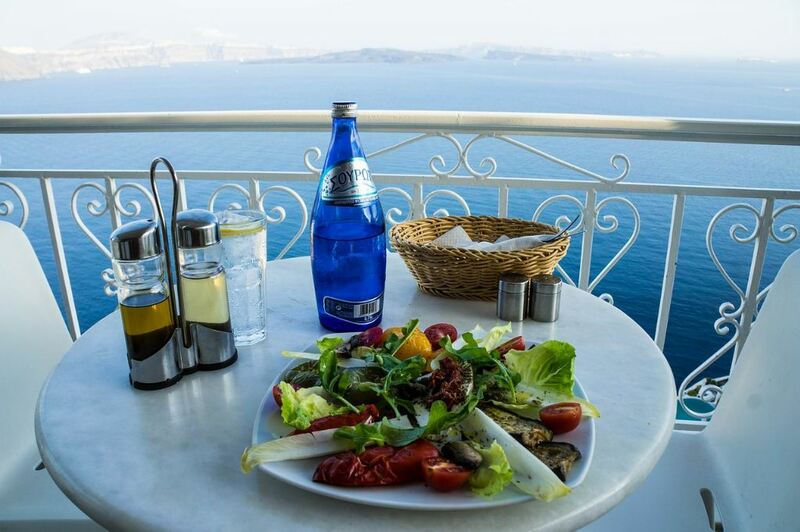 Picture: Santorini travel tips blog. 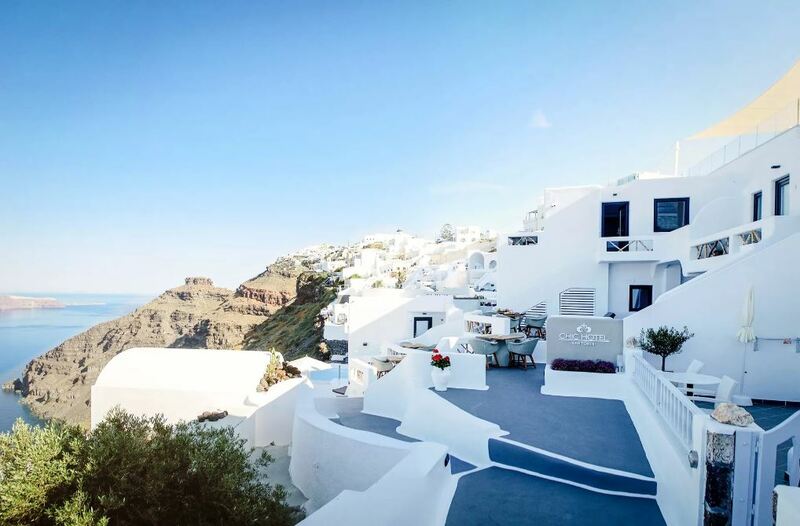 Santorini’s commercial development is focused on the caldera-edge clifftops in the island’s west, with large clusters of whitewashed buildings nesting at dizzying heights, spilling down cliffsides and offering gasp-inducing views from land or sea. 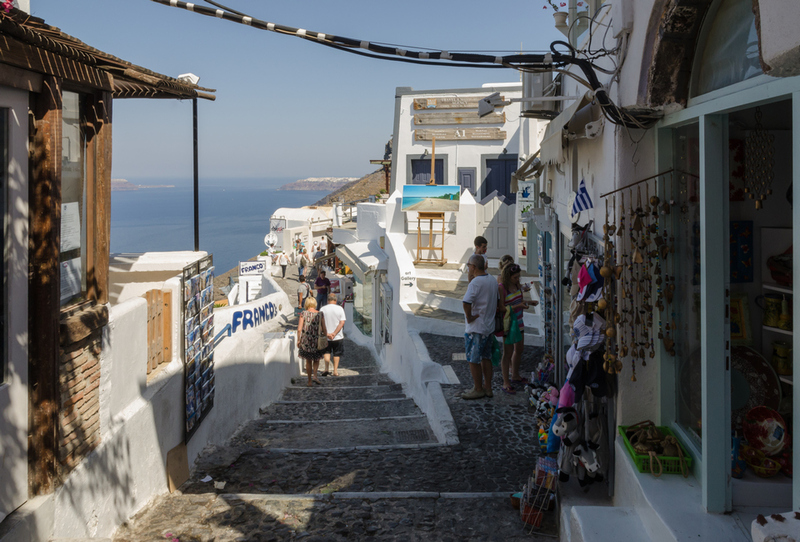 Fira, the island’s busy capital, sprawls north into villages called Firostefani (about a 15-minute walk from Fira) and Imerovigli (the highest point of the caldera edge, about a half-hour walk from Fira). 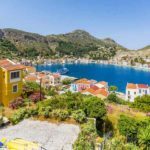 A path running through these villages is lined with upmarket hotels, restaurant terraces and endless photo opportunities. 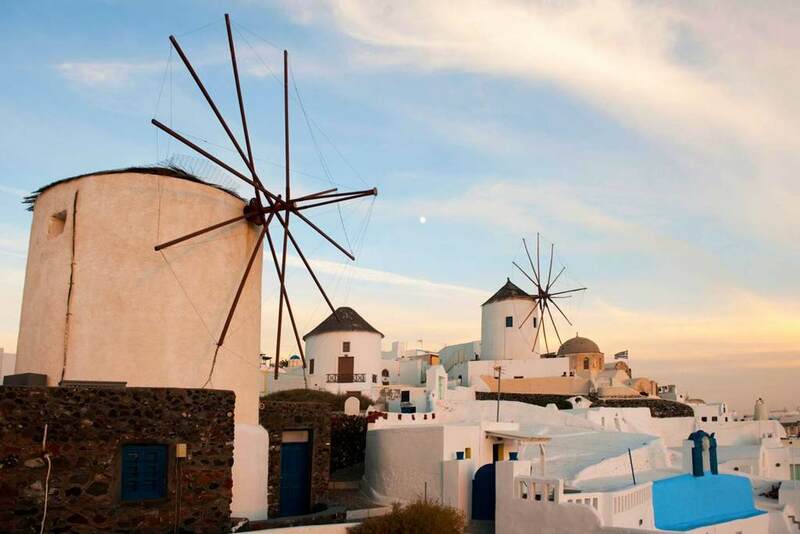 Windmills in Oia village. 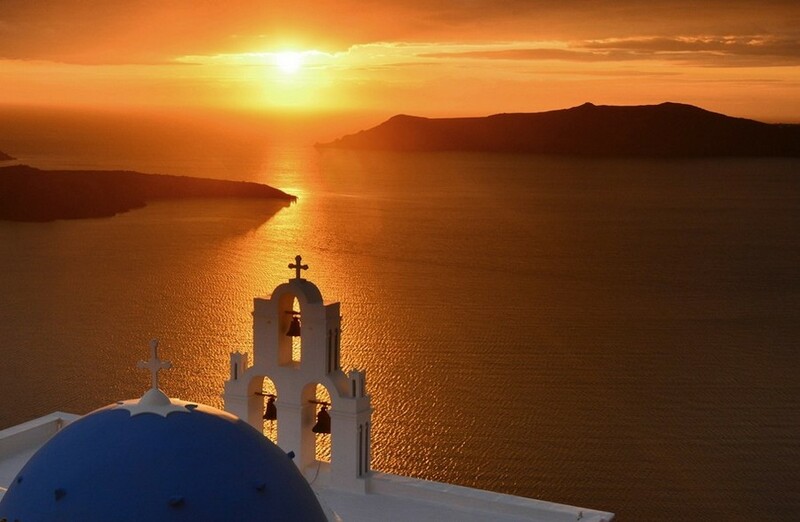 Picture: Santorini travel tips blog. 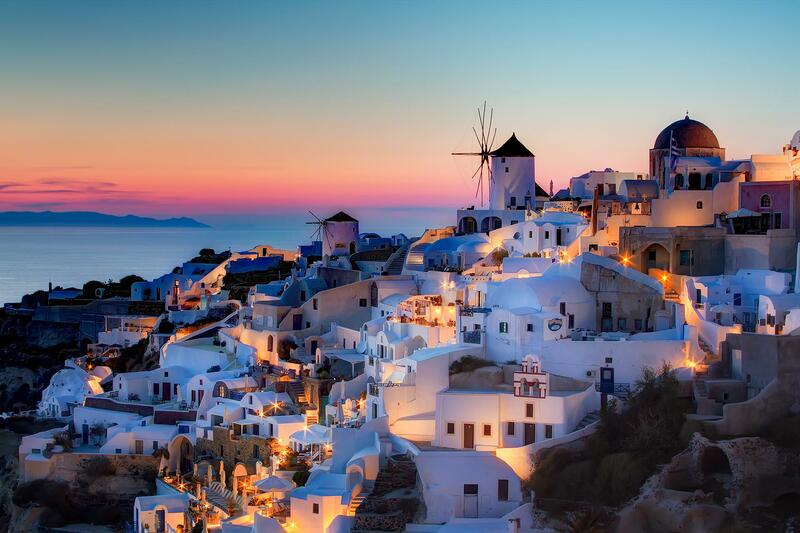 These three conjoined settlements draw most visitors, together with the stunning and quite exclusive village of Oia in Santorini’s north. 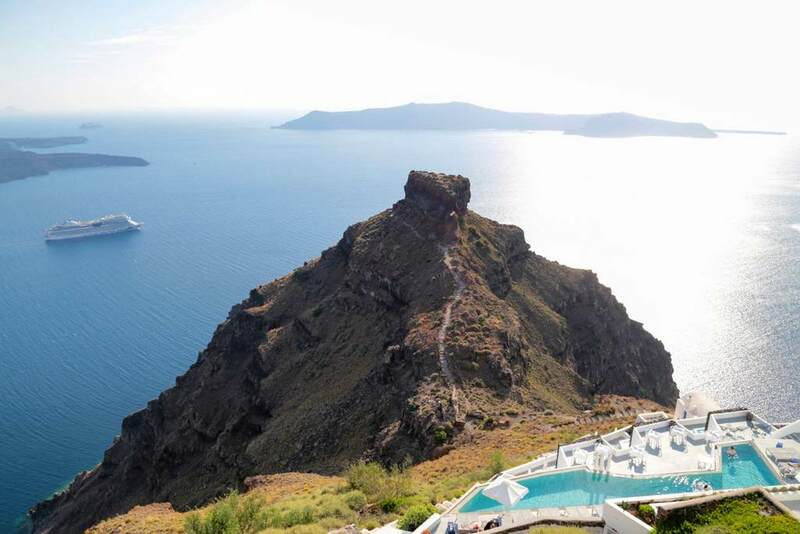 There’s a growing number of hotels in the island’s south, offering caldera views to the north and northeast. 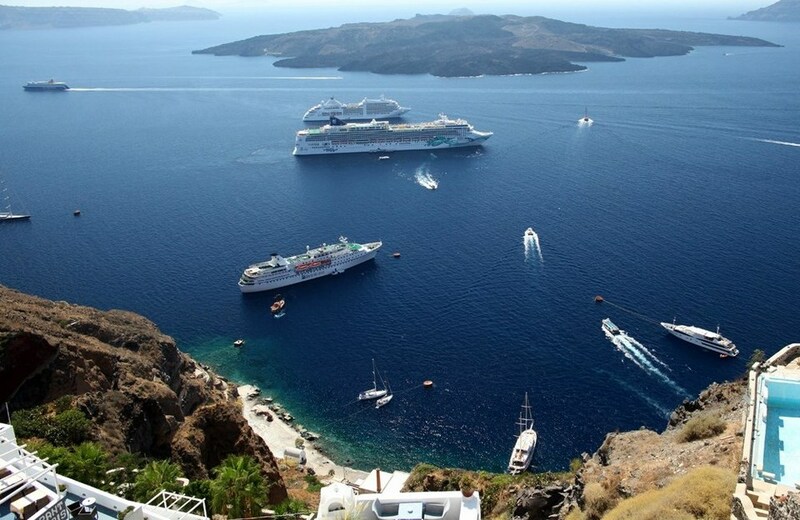 Akrotiri’s views come cheaper than Oia’s, but it’s a fair way from the action of Fira. 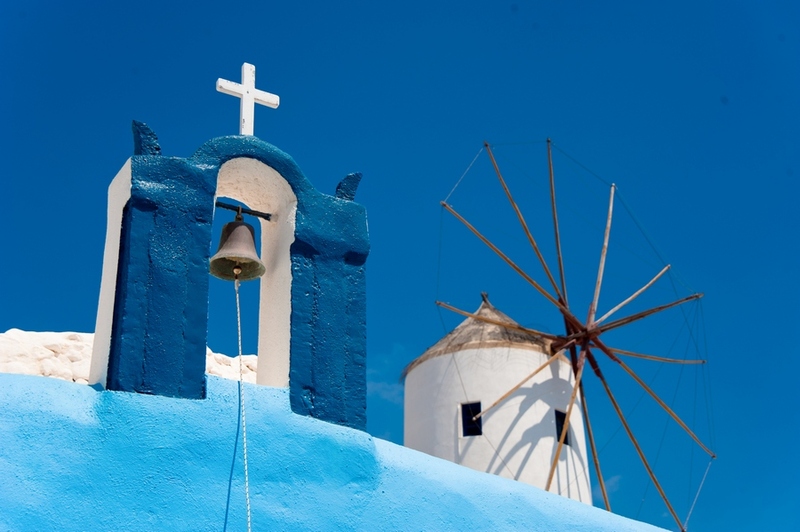 Bells of the Blue domed Church dedicated to St. Spirou in Firostefani. 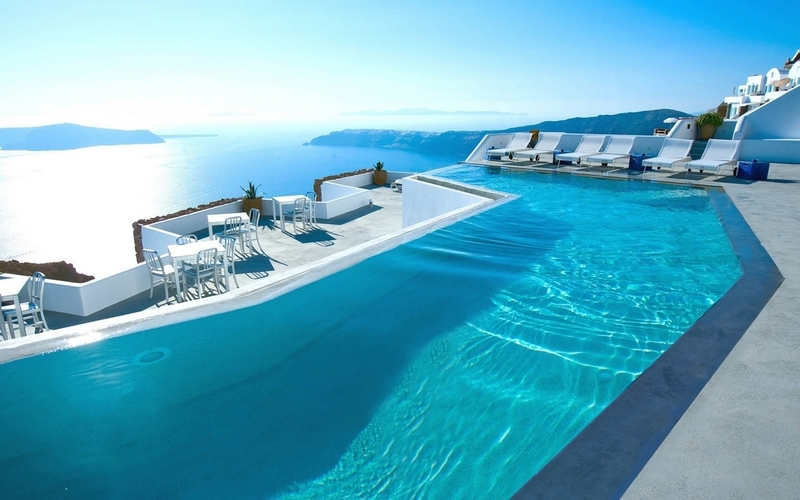 Picture: Santorini travel tips blog. 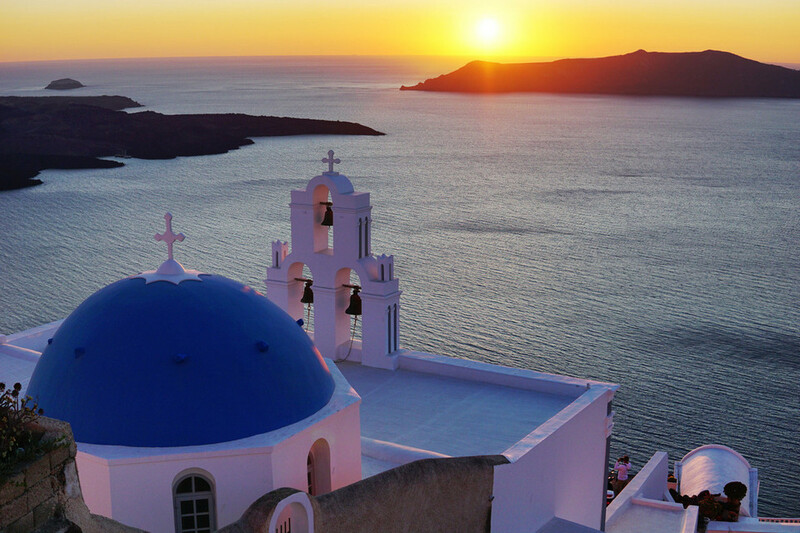 Santorini’s east coast is lesser known than the celebrated, elevated west coast. 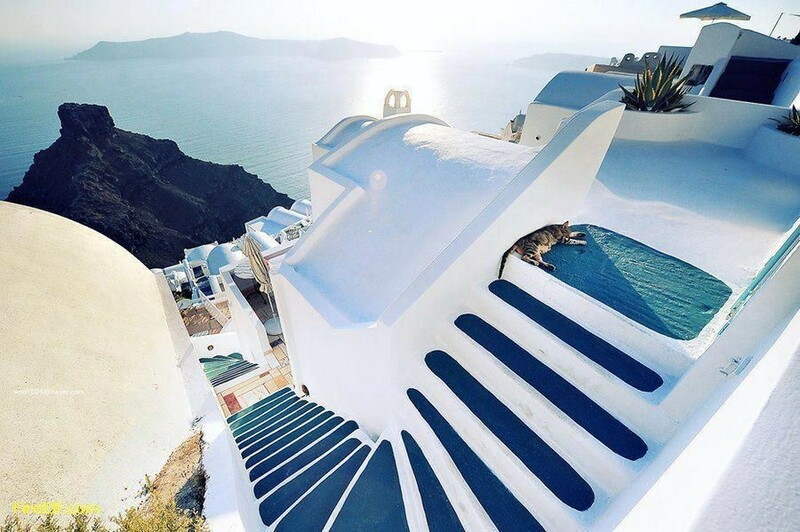 Here, the caldera-edge heights have sloped down to sea level, and volcanic-sand beaches and resorts offer a very different drawcard. 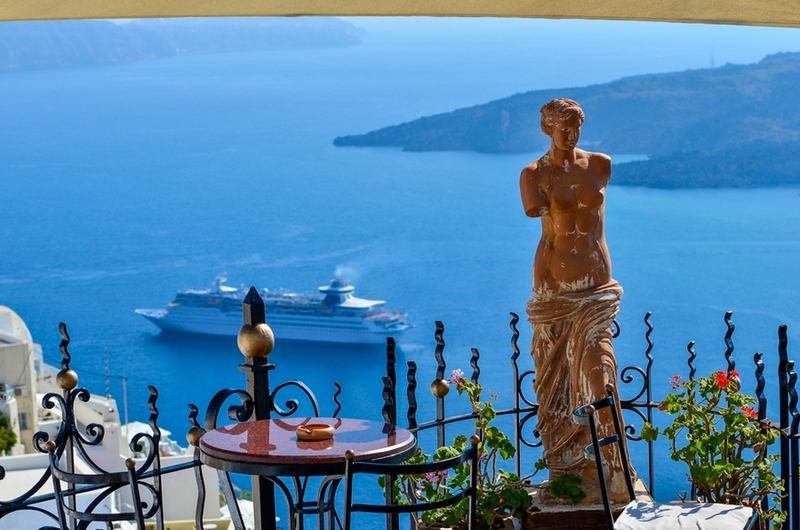 East-coast resorts such as Kamari and Perissa have a more traditional (and more affordable) island-holiday appeal: sunlounger-filled beaches, water sports, bars and taverna-lined promenades. 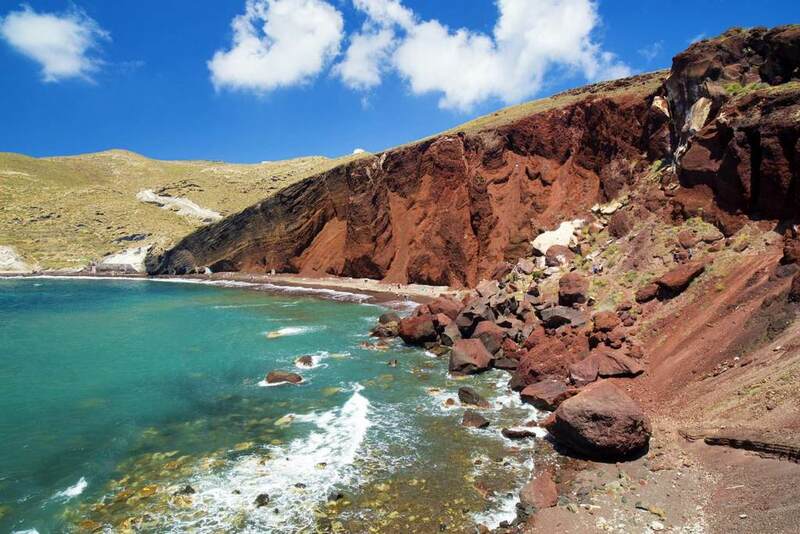 The east coast’s beaches are lined with black sand; on the south coast, there’s a string of beaches famed for their multicoloured sand – dramatic Red Beach is a traveller favourite. 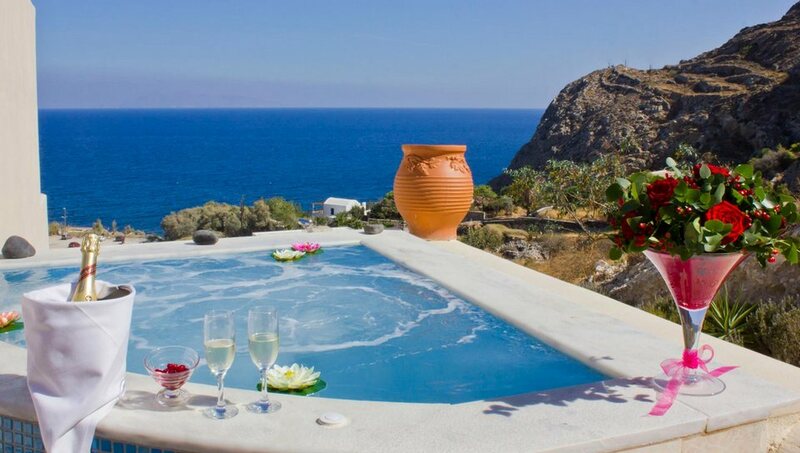 The island’s interior is dotted with vineyards and traditional villages that let you see beyond the tourist hustle. 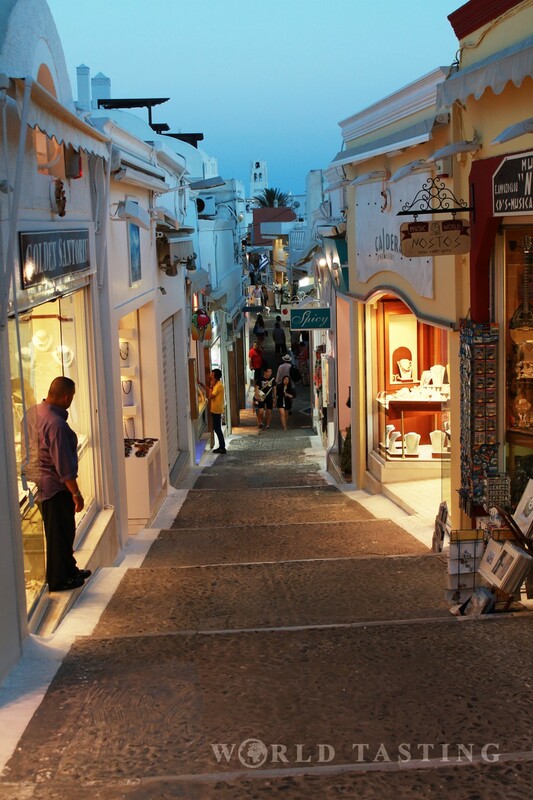 Make a stop in Pyrgos for great eats and a wander through charming backstreets. 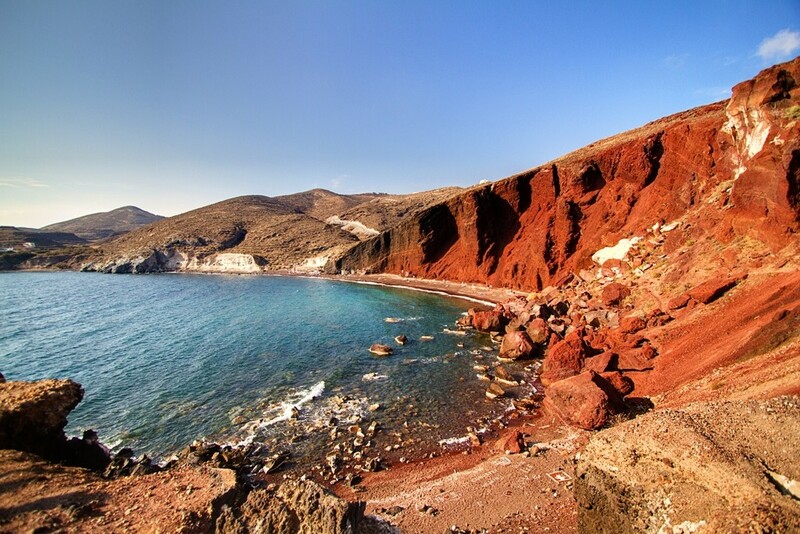 Red Beach on Santorini’s south coast. 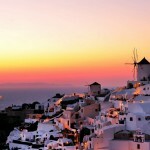 Picture: Santorini travel tips blog. 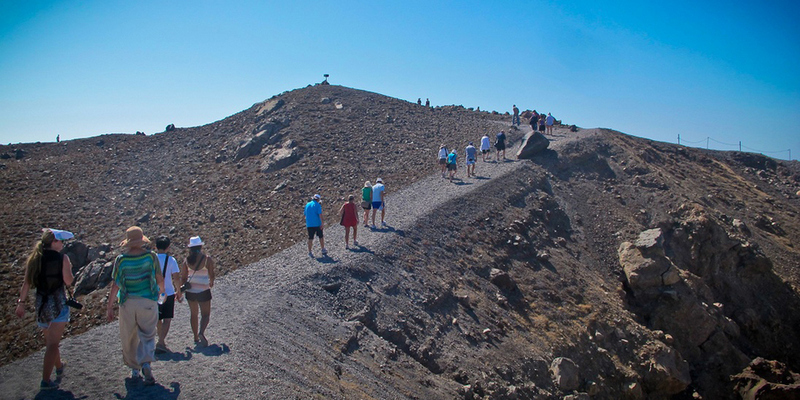 The obvious activity is to walk the caldera edge and admire the views. 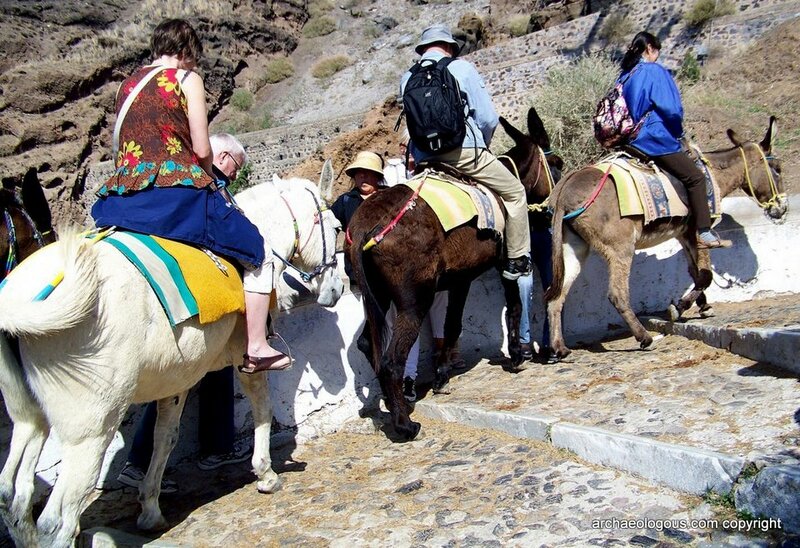 Walks in and around Fira are spectacular, particularly heading north to Firostefani and Imerovigli along the caldera-edge pathway. 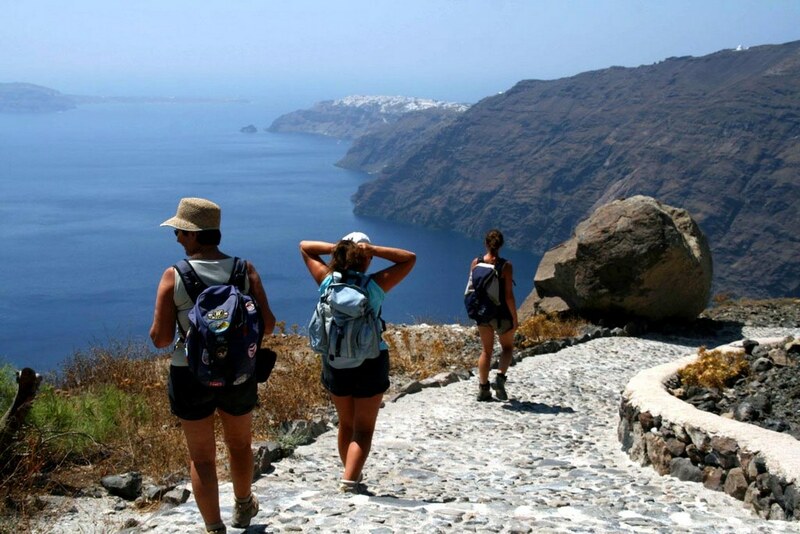 Keep walking and you’ll eventually reach Oia, but be aware that this is no small undertaking and the trail beyond Imerovigli can be rough. 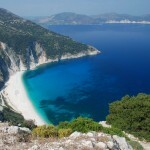 It’s about 9km in all, and a good three- to four-hours’ walk in one direction. 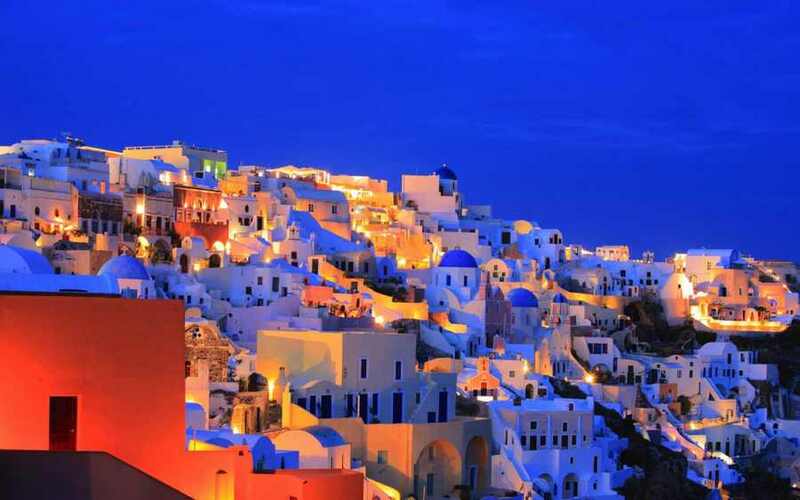 Santorini’s lauded wines are its crisp dry whites and the amber-coloured, unfortified dessert wine known as Vinsanto. 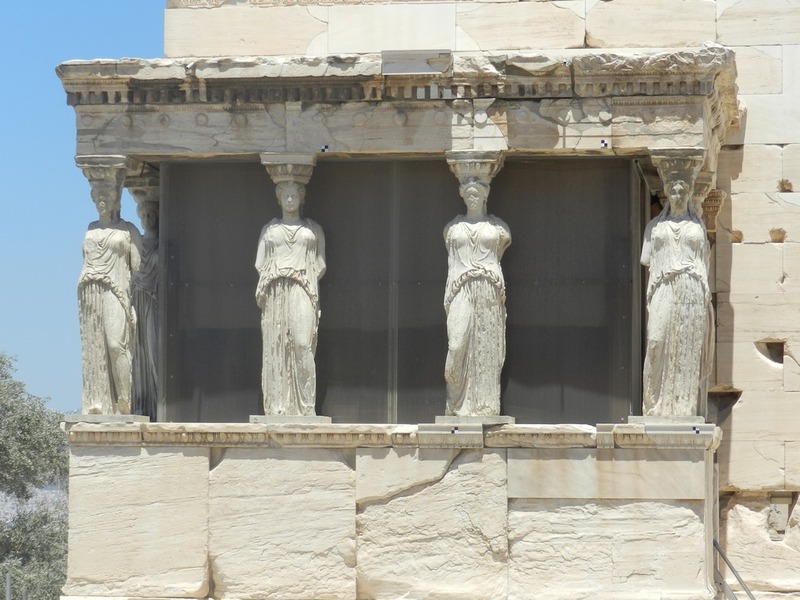 Both are made from the indigenous grape variety, assyrtiko. 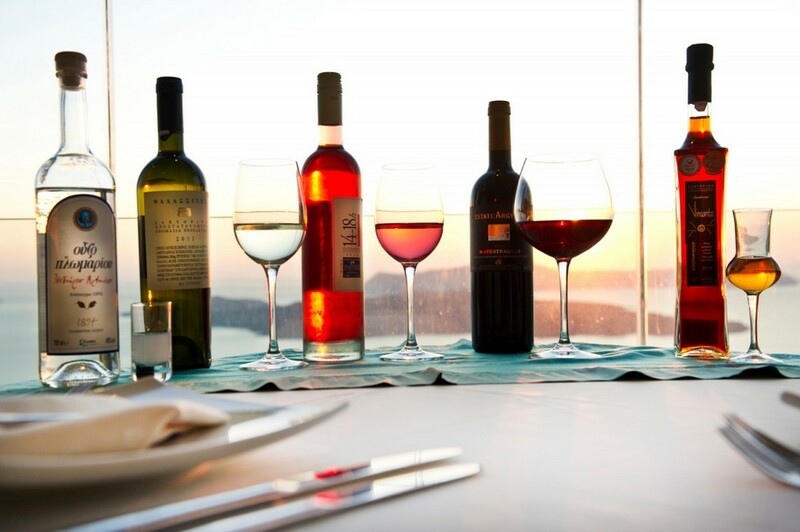 About a dozen local vineyards host tastings (usually with a small charge) and some offer food, with scenery and local produce combining to great effect. 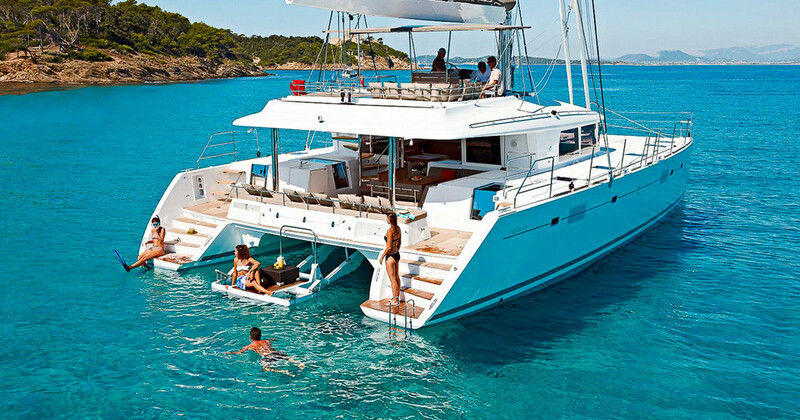 Start your investigations at the large, slick SantoWines. 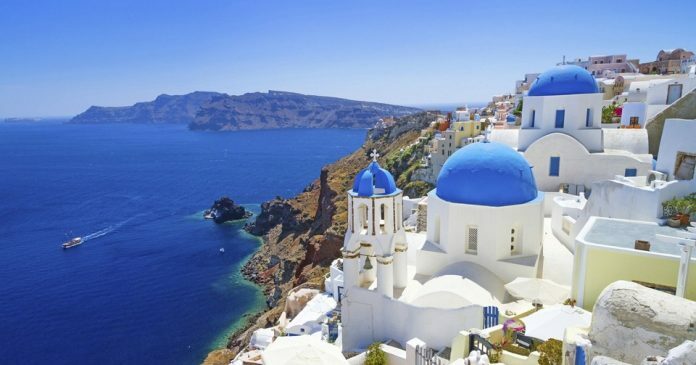 Santorini’s intrigue reaches deep into the past, with the fascinating site of Akrotiri displaying a Minoan city destroyed by the volcanic eruption of 1613 BC. 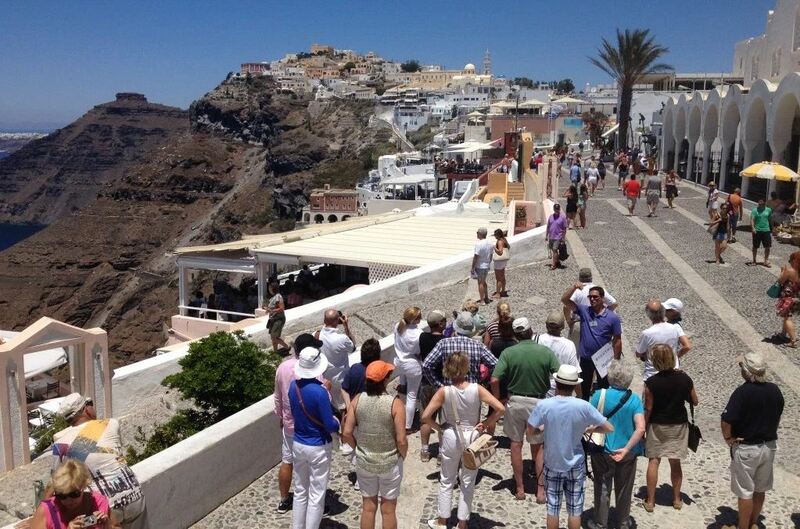 In Fira, the impressive Museum of Prehistoric Thera helps piece together the story of ancient Akrotiri. 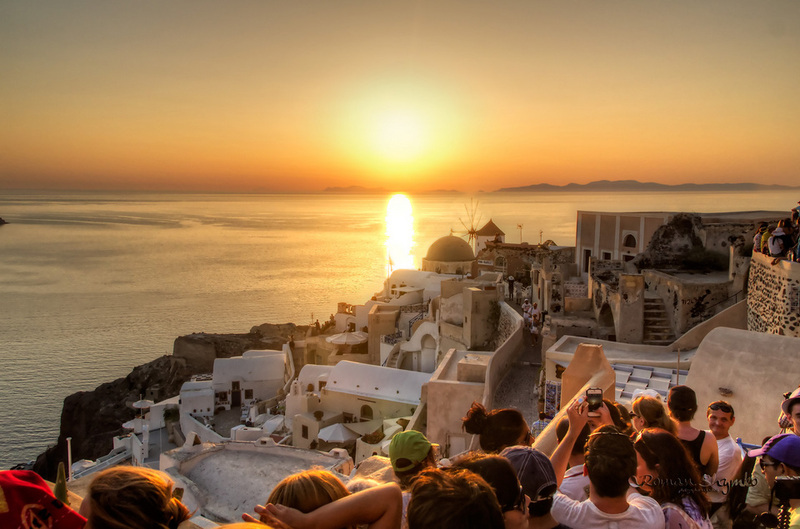 Nature’s handiwork is on display from any waterfront seat come sundown, but prime sunset-viewing is in Oia, where thousands of tourists flock to admire (and applaud) nightfall. 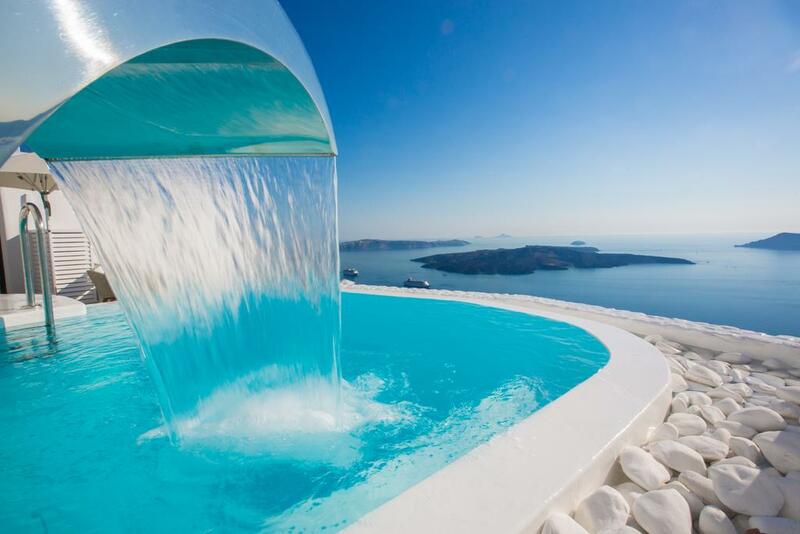 Take the plunge: at your hotel’s infinity pool or your suite’s private plunge pool, from the edge of a boat on a caldera cruise or on a black-sand beach on the east coast. 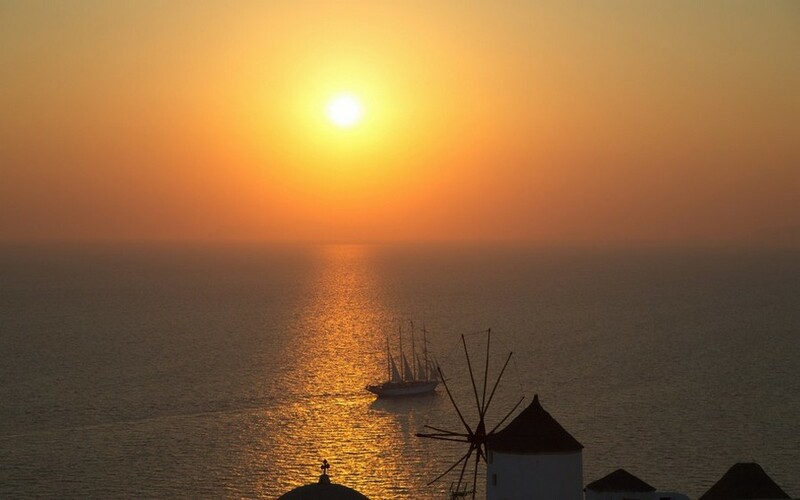 Any tour your heart desires can be organised – there are dozens of agencies ready to help with winery visits, archaeology tours, sunset-watching and more. 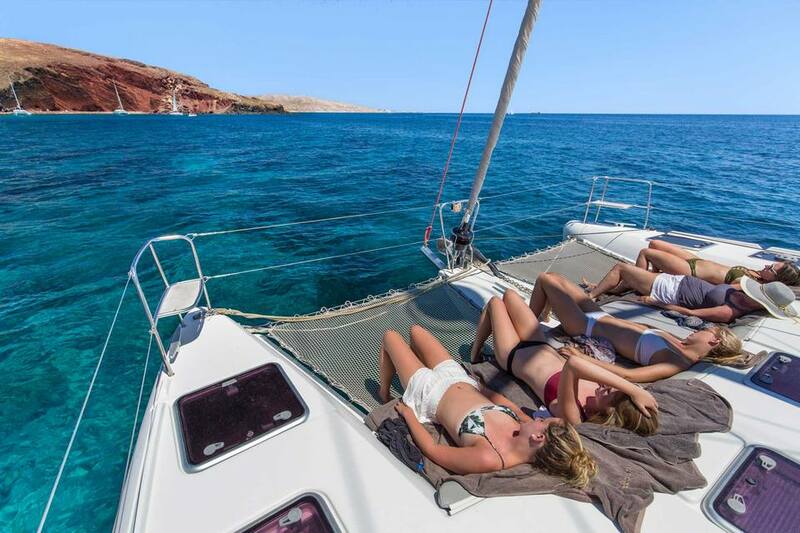 The most popular option is a cruise, and the classic itinerary takes in the caldera’s volcanic islands of Nea Kameni and Palia Kameni, including a stop at the former’s crater and the latter’s hot springs. 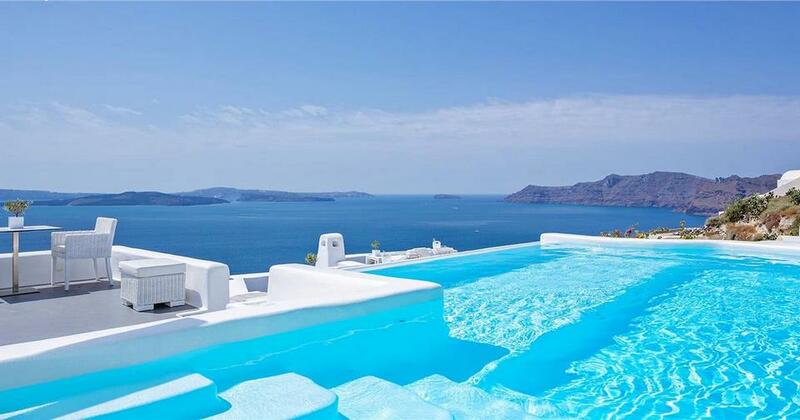 Sure, there are views that stop you in your tracks and great glimpses into how A-listers travel. 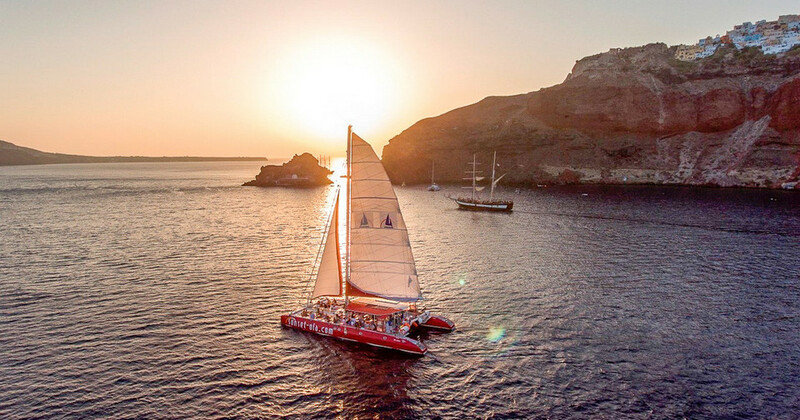 But away from Santorini travel headlines there’s plenty to explore, from a gorgeous open-air cinema to a cool microbrewery, wine caverns adorned with artworks, and cooking demonstrations and classes which celebrate Santorini’s growing foodie culture. 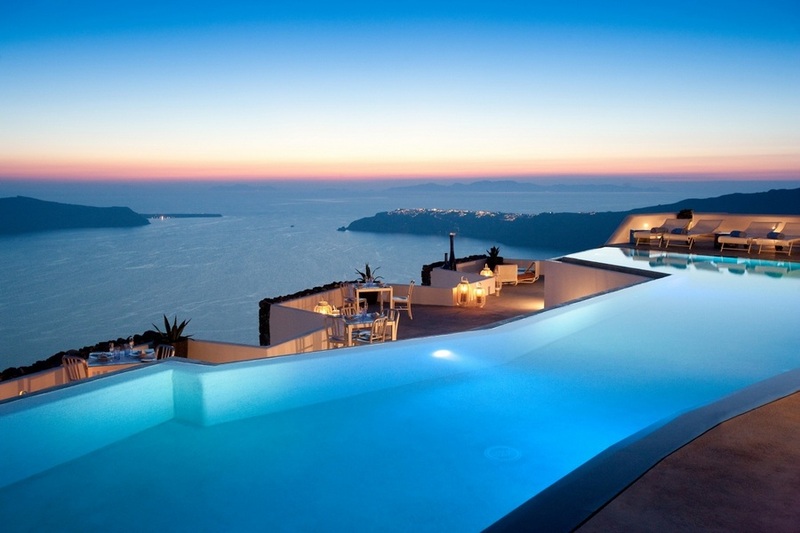 If they can afford it, first-timers to Santorini should stay on the caldera edge to experience the full “wow” factor. 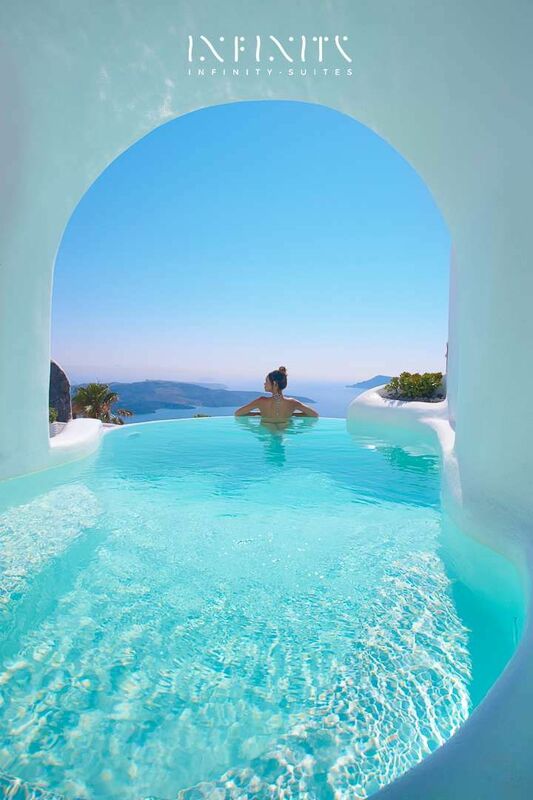 Fira, Firostefani, Imerovigli and Oia have hotels and villas with whitewashed interiors, terraces and infinity pools that have inspired marriage proposals, high-fashion photo shoots and many an Instagram post. 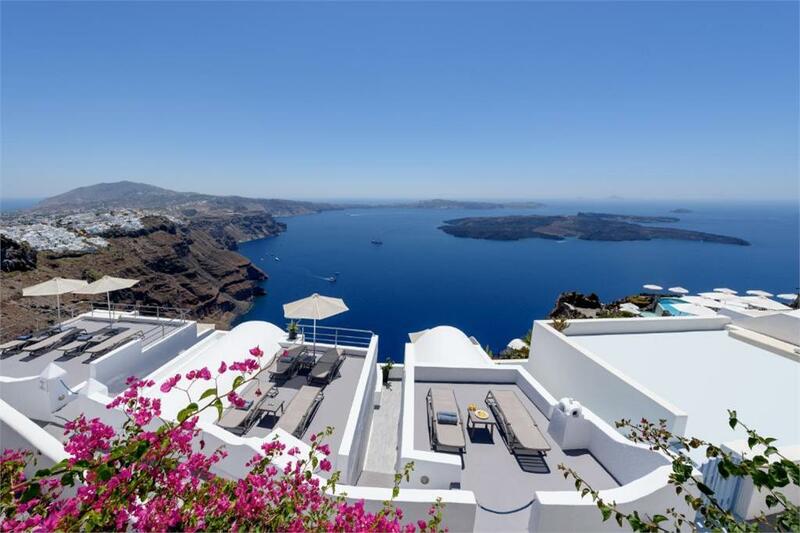 Sadly, there’s not a lot in these view-blessed locales for budget-conscious travellers: caldera-view accommodation comes at a premium and it’s in hot demand (book ahead). 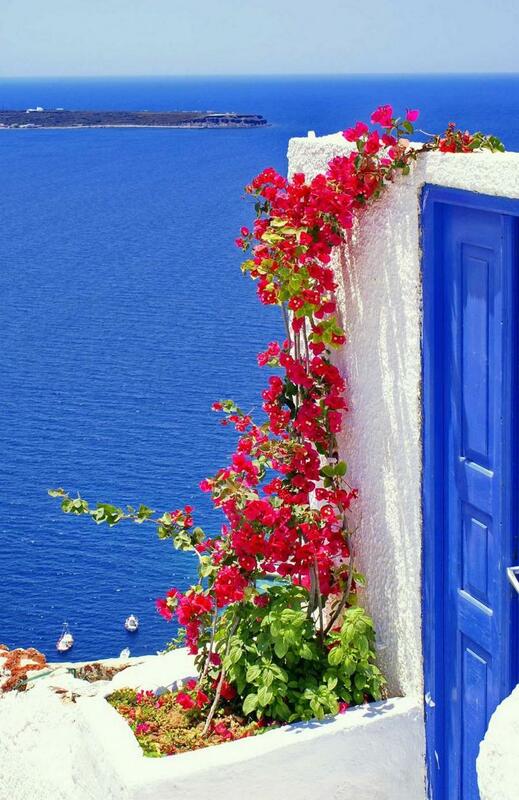 Dramatic view from towns in Santorini island. 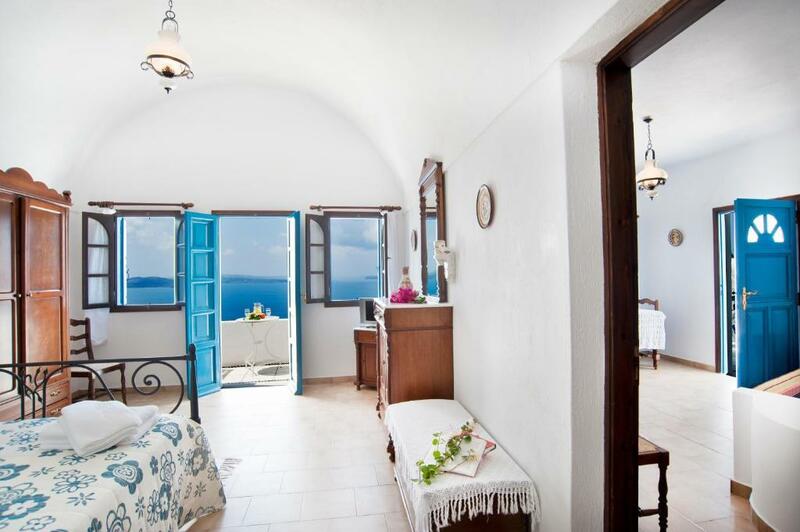 There are decent midrange options in Fira and Firostefani (less so in Imerovigli and Oia), away from the front-row panoramas. 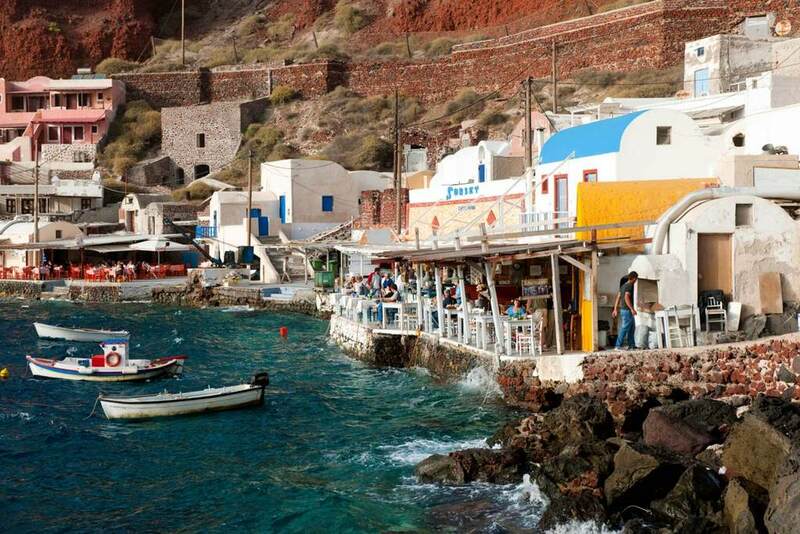 There’s also a great hostel and a budget-friendly campground (with rooms) on the outskirts of Fira. 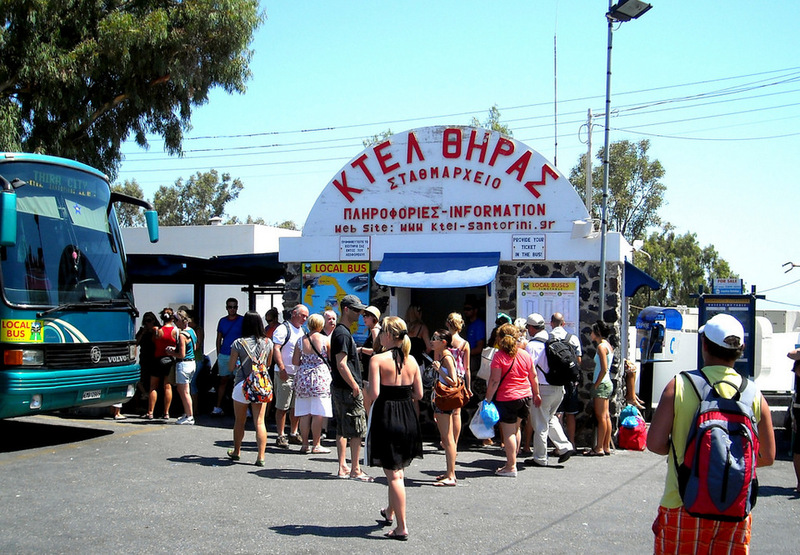 If you’re more interested in a beach break or activities, stay in Perissa or Kamari (and catch the bus into Fira). 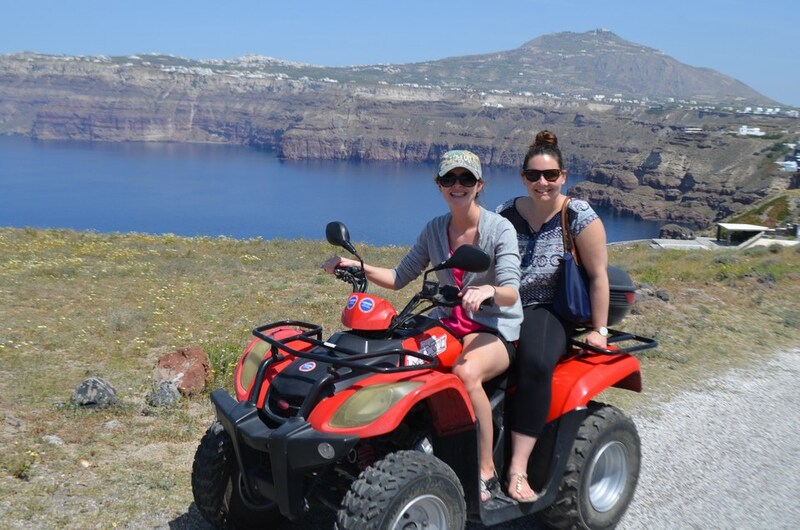 The advantage of this is some respite from the camera-toting caldera crowds, and more reasonable prices. 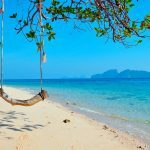 Peak travel time is July and August, when prices soar and hotels, viewpoints and beaches are packed with tourists. 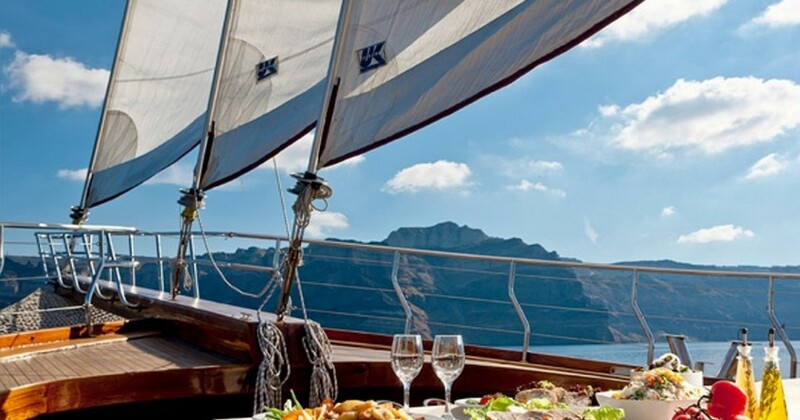 The shoulder-season months of April, May, early June, late September and October are good times to visit – things are marginally quieter at the caldera edge, and considerably quieter on the east coast (where accommodation bargains are plentiful). 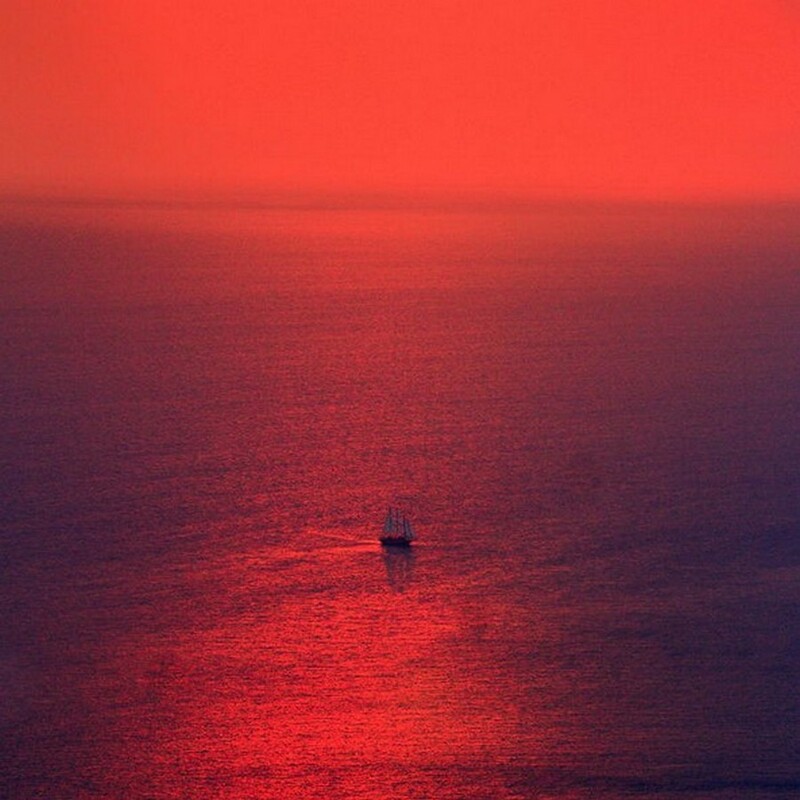 Don’t discount a winter break, when crowds are scarce (and prices low) while the scenery is still breathtaking. 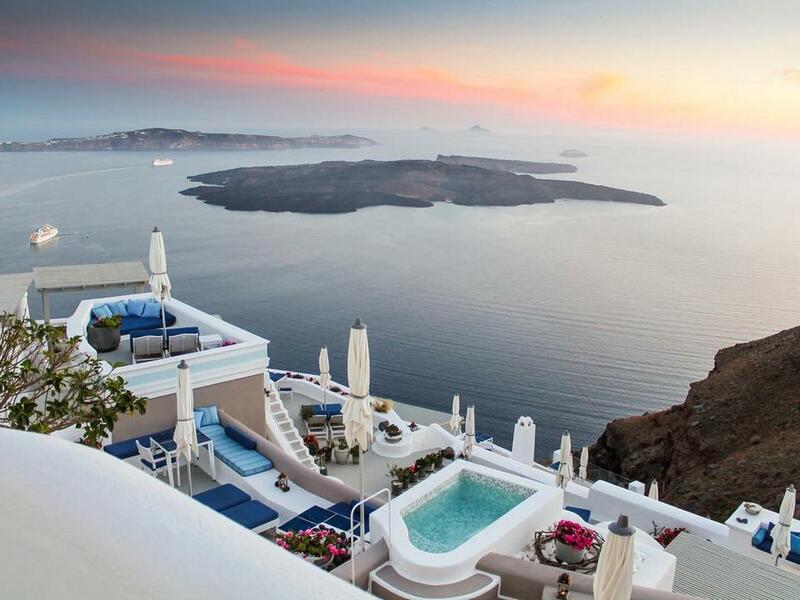 Santorini is working on positioning itself as a year-round destination. 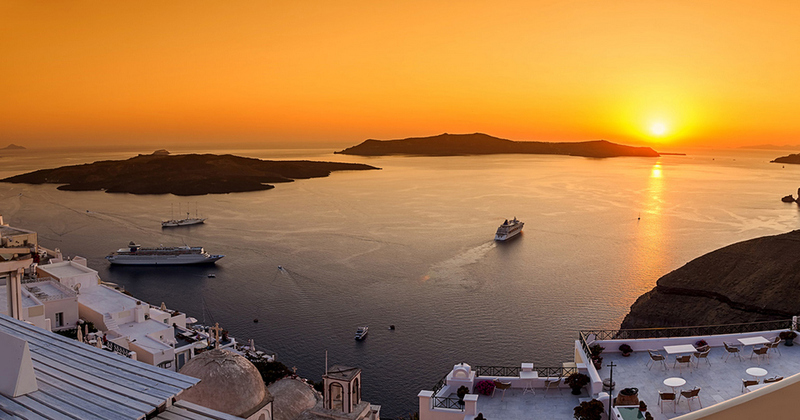 Frequent ferries and high-speed catamarans link Santorini with Athens’ main port of Piraeus, Crete and various Cycladic islands. 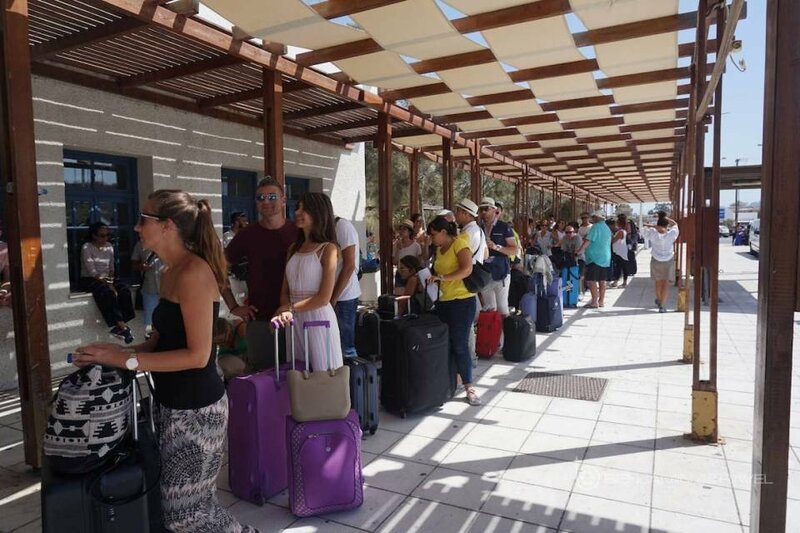 Your best bet for ferry timetables is OpenSeas (openseas.gr). 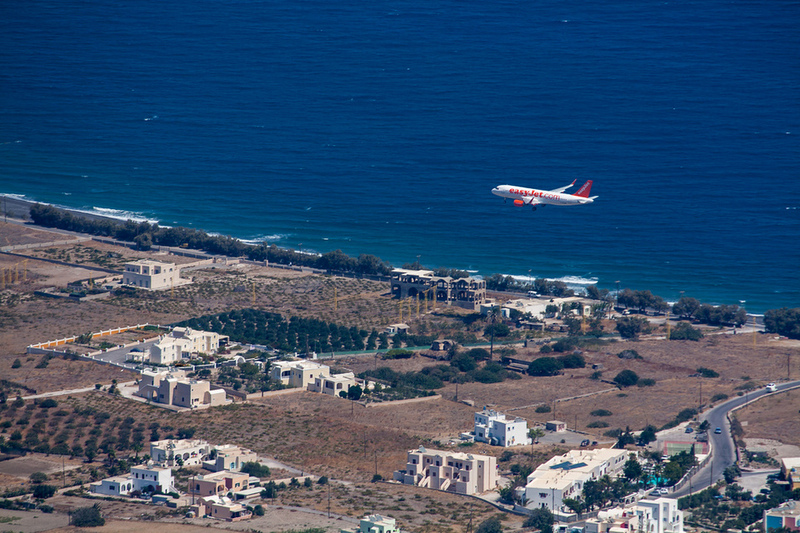 Santorini Airport (santoriniairport.com) has year-round flight connections with Athens, and summertime European connections. 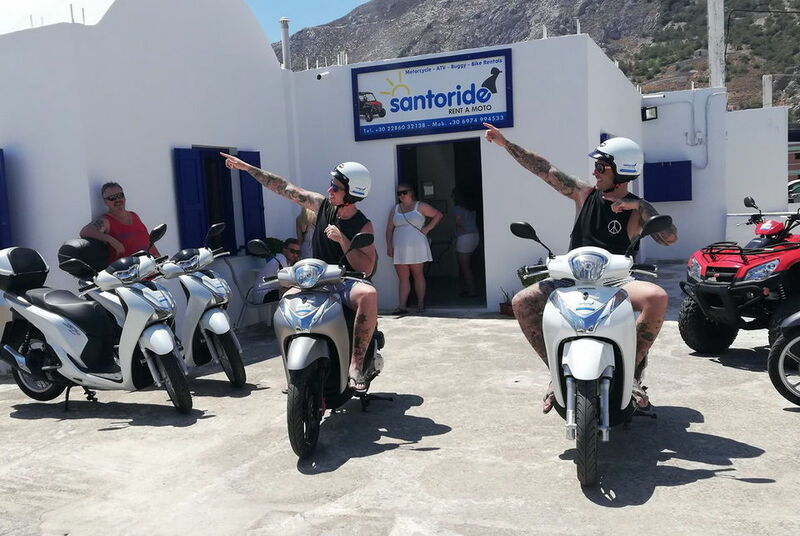 On the island, bus services are decent (if crowded in summer); loads of companies offer cars, mopeds and ATV four-wheeler bikes for rent. 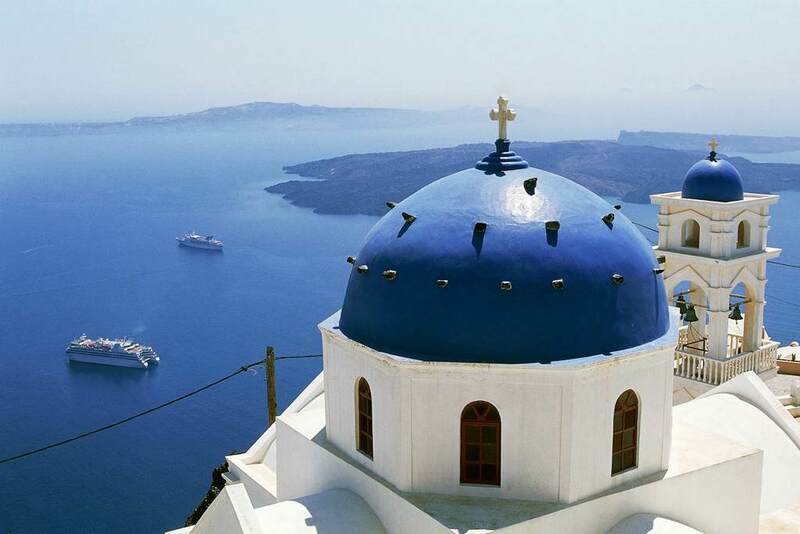 Are you looking for more top things to do in Santorini: Tours, activities, attractions and other things? 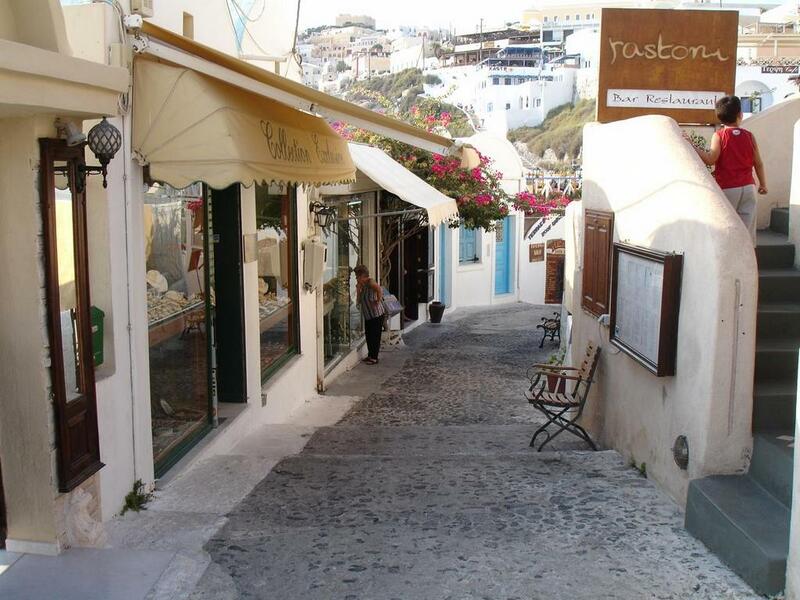 Let’s check it out in Fira, Oia, Imerovígli, and Santorini Volcano. 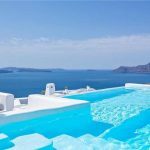 And Santorini travel blog — The fullest Santorini travel guide for a budget trip to Santorini for the first-timers.